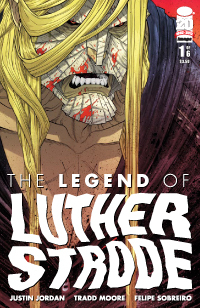 This is my first time reading any Luther Strode at all, so you’ll have to pardon any ignorance I have when it comes to this book. 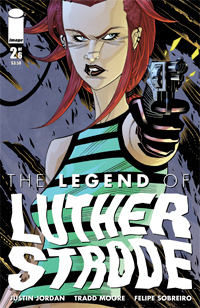 The Legend of Luther Strode #2 takes place 5 years after the first series, and honestly, after reading this issue, I could wait another 5 years to read another issue of this book. Writer Justin Jordan turns out a book that’s not quite sure where it’s going. The character of Luther Strode is basically the Punisher Max with some sort of super powers. Strode is putting his fist right THROUGH people, pulling theirs heads literally off their bodies, and other such violence. Now, I am the LAST person that has a problem with graphic language, violence, or anything like that, but it just doesn’t work here. Jordan tries too hard to make everyone say the F word or any other colorful language that he can come up with. Also, Jordan takes a cue from a bunch of action movies, and has a young girl try and be the voice of reason for Strode. Again, it just doesn’t work for me. Freelancers #1 is a lot of fun. It’s not going to change your life or win an Eisner, but you will definitely have a good time with this comic. You’ve got the perfect formula-hot girls, guns, cars, kung-fu, and dogs. What more could any red-blooded American male want? Ian Brill takes parts of existing pop culture icons and combines them into an action packed comic, that’s a TON of fun to read. 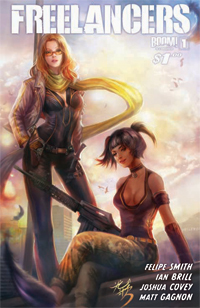 Part Charlie’s Angels, part Codename: Knockout, this comic is action from start to finish. You’ve got the two main characters that work for an agent that may or may not be 100% on their side. Brill sets up a good mystery that leaves you wondering if their agent is trying to get them jobs or trying to get them killed. I can’t emphasise enough how much pure fun this book is! It’s a great spy/bounty hunter tale that never takes itself seriously at all. It knows what it is, and never tries to be anything different. Really good for a first issue.